Animals bring joy and fun into our lives, and they can be good for our health, too. For those who aren’t able to keep a pet at home for financial or other reasons (having a pet can be a lot of work! ), InnovAge offers service and therapy dogs in our PACE centers. Read on to learn more about the benefits of animal companionship for older adults. Visits from a friendly dog can break the daily routine, which gives participants at our PACE centers something new to focus on. We’ve seen first-hand how simply petting a pup can encourage warm, social behavior among our participants. InnovAge Occupational Therapist Susan Parks regularly brings her dog Rosie to the Denver PACE center to spend time with participants. Studies also show that interacting with animals can improve older adults’ overall health, both cognitively and physically. The following are some physical and mental health benefits of animal companionship for older adults. Catch a glimpse of Rosie in action at our Denver PACE center by watching this video. Explore the blog to discover more ways for older adults to stay healthy, including advice from an InnovAge dietitian, age-appropriate exercise, and more. 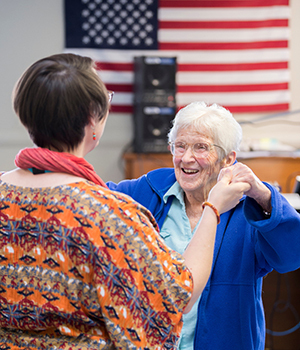 Learn about the fun and intentional ways our staff work with senior participants at InnovAge PACE centers.